A single diamond solitaire is centered in this uniquely made heart ring for women in solid 14k yellow gold, representing your undivided love. Diamond is a single quality, white G-H Color, I1 Clarity stone weighing a total of 0.03 carats. Band measures 1.7mm with a 3.5mm top height. 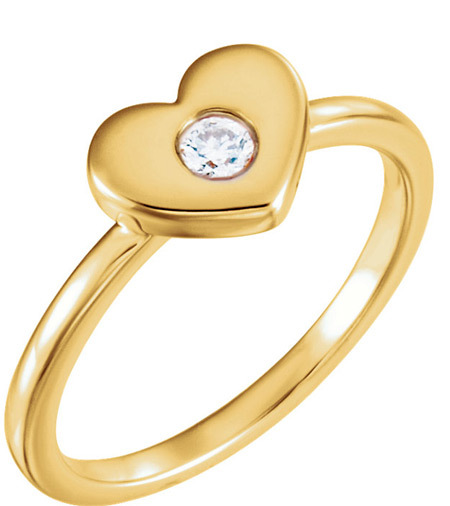 This heart ring is available in women's sizes 5-9, including half sizes. Ships free from Apples of Gold Jewelry! From the Apples of Gold heart jewelry collection. Also available in 14k white gold, rose gold, or sterling silver (shown below). We guarantee our Solitaire Diamond Undivided Heart Ring for Women in 14K Gold to be high quality, authentic jewelry, as described above.